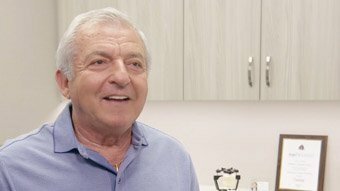 A permanent solution to replace multiple missing teeth and restore normal dental function. Don’t go another day with missing teeth. Restore your health and smile with a dental implant bridge. • Are you careful not to smile too broadly? • Tired of covering the “gap” in your smile with a finger to your lips? • Has choosing “the right” foods become an ordeal? Don’t compromise any longer. It’s time to contact Harrell Implant Center to discuss an implant bridge – the permanent solution for your missing teeth. Dr. Robert Harrell is the Charlotte-area leader in implant dentistry. His distinguished career is dedicated to creating beautiful smiles while restoring dental function. 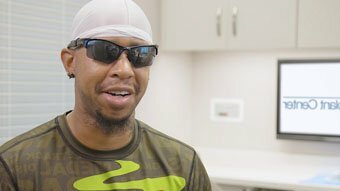 Over the years he has placed countless numbers of implants, each one customized to fit the unique needs of the recipient. The Process: Why implant bridges are better than traditional bridges. Implant-supported bridges provide an extremely durable solution for patients missing multiple teeth. Implant bridges are similar to single-tooth implants except multiple teeth can be replaced by only two posts. Unlike a traditional crown and bridge, which demands alteration of natural teeth to place a crown, implant bridges consist of two posts on either side of the missing tooth. Replacement teeth span the area and provide a more functional eating surface than typical bridges. You’ll be able to clean the area between the gum and the bridge with a special type of floss or a small brush. Otherwise, you may treat the bridge like your natural teeth. Your implant-supported bridge will feel more secure and comfortable than a removable partial denture, which rests on the gums. You will chew food comfortably, and the bridge will look like the natural teeth it is replacing. When is it the right solution? An implant-supported bridge is used when more than one tooth is missing. It also may be used if Dr. Harrell is concerned that you might put too much pressure on individual implants that are not connected. For example, clenching or grinding your teeth can put a lot of pressure on individual implants. This can increase the chances they will loosen from the bone and fail. An implant-supported bridge reduces the pressure on the individual implants in the bone, and spreads it across the entire bridge. If the implants will be placed next to natural teeth, the natural teeth and surrounding gums must be in good health. If you don’t have enough bone to place and support the dental implants, the supporting bone can be built up using bone augmentation or grafting before the implant procedure begins. 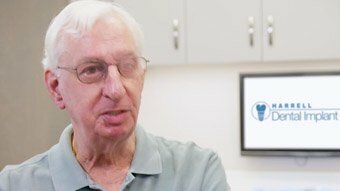 In some cases, Dr. Harrell may not want to put an implant in a certain place in your mouth. There may not be enough jawbone to support an implant, or the location may be too close to a nerve or sinus cavity (above your upper teeth). He determines this from the 3D-Cone Beam scan that is taken at your consultation appointment. In such a case, Dr. Harrell can avoid the area by placing implants on both sides of the space. An implant-supported bridge will be attached. An implant-supported bridge also can be made similar to a traditional bridge, with a crown suspended between two implant-supported crowns. The implant is made of titanium and surgically placed in the jawbone. You may have one implant for each missing tooth. In other cases, your dentist may skip one or more spaces because there’s not enough jawbone, or because the space is too close to a nerve or sinus cavity. The abutment is a cylinder made of titanium that is screwed onto the implant. The restoration is a series of crowns connected to form a bridge. They are made of porcelain, attached and fused to a substructure of metal. The time it takes to complete the implant process depends on many factors. When the traditional method of placing an implant is used, the shortest time frame is about five months for the lower jaw and seven months for the upper jaw. This includes surgeries and the placement of the implant-supported bridge. However, the process can last a year or more, particularly if bone needs to be built up first. Two surgeries are usually required to place and prepare the implant. During the first surgery, the implant is placed in the jaw and covered with gum tissue. Dr. Harrell may wait three to six months. At the end of the healing period, a second surgery is done to expose the implant so that the bridge can be placed. To help determine where the implants should be placed, Dr. Harrell creates a model, called a wax-up, of what the bridge will look like when it is completed. To do this, he uses a model of your mouth made from impressions taken of your teeth and jaw. Using the wax-up, he will make a surgical guide. The surgical guide is a clear piece of plastic similar to a mouth guard. It fits over your existing teeth and extends over the area where teeth are missing to show where the implants need to be placed. 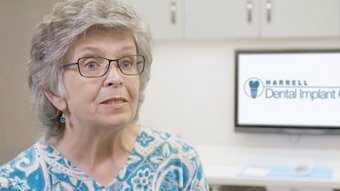 After the first surgery, Dr. Harrell typically waits three or four months if implants were placed in the lower jaw, and five or six months if they were placed in the upper jaw, before scheduling the second surgery. During this time, bone and implants fuse to one another in a process called osseointegration. Once the implants have fused with the bone, you can schedule the second surgery. Dr. Harrell will determine if the implants are ready for the second surgery through X-rays. This second surgery is simpler than the first. A small incision is made in your gums to expose the tops of the implants. A collar, called a healing cap, is placed on the head of the implant after it is exposed. This ensures the gums will heal correctly. The collar is a round piece of metal that holds the gums away from the head of the implant. The collar will be in place until the temporary bridge is inserted. The temporary bridge is made of softer material than the permanent bridge. The softer material helps cushion and protect the implant from the pressure of chewing. During the next visit, Dr. Harrell will test the fit of the metal framework that supports the porcelain bridge. If the framework doesn’t fit correctly, it will be adjusted and you will return for another try-in. It might take several visits before the fit is right. Dr. Harrell will see to it. We take pride in giving life-changing smiles. From single implants to full-mouth makeovers, the patient transformations in our gallery are amazing. With 0% for 12 months financing or low interest-low monthly payment options, our team can help you find the resources to restore your oral health. We offer the latest in dental implant technology. Schedule your FREE consultation to learn how scientific advancements in treatment can renew your smile and restore your confidence.